I am no fashion plate and hair is probably my biggest downfall. I won't use products in my hair and I refuse to spend time doing things to it. Wash and go and dry my bangs (I have to have bangs. I think there's a law somewhere. My forehead is way too big and scary.) and have it long enough to put up when I exercise. Long ago, my hair became a nuisance and I became one of those people who can't stand to have their hair touching them. (it's touching me, it's touching me!!!!!!!!) It's fine for a few minutes, especially when I am not doing anything, but as soon as I have to move around it starts moving and fall forward, it's all over. I don't even like to have the end of my ponytail touching me when I exercise. I always thought if I let it grow, it would get past whatever the annoying point is and it would hang freely and be just gorgeous. I guess I've never let it get past that magical point because even here, at the longest I think it's ever been, it was a daily nuisance. 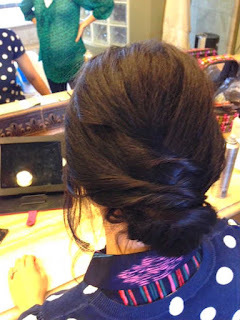 For a couple of weddings that I was in, I had my hair done but it looked like crap both times. In both cases, they used a lot of hairspray to hold it, but all that did was solidify the fact that I don't have thick hair that's bright and pretty. For one of them, I went with day old hair, the guy started putting stuff in to "dirty it up to make it work" and it got so sticky and dirty, he actually made me go to the sink so he could wash it and start over. The result was nothing better than what I could have done for free. And I wouldn't have used so much hairspray so it could have actually moved a little. I love the idea of big hairstyles for events. I'm okay with the teasing and enlarging of the hair for a wedding or ball or whatever, especially since I don't do that stuff every day, so I think my hair can take it. All those glamorous Hollywood pictures always give me hope that someone will some day make my hair look splendid if only just for a few hours. I just can't find the stylist to do it. In what will surely be a circumstance of wild irony, it will probably be my mortician who gets it right. In any case, I was on blogher.com today and came across this post about Taylor Swift's Red Carpet Ready Hair. That girl has some great hair. I don't know how she manages to live with it touching her like it does, especially when she talks sings her songs in the 3 notes she can hit. I would have to rip it out if I were her. I can't say I've ever seen her hair look bad. It's probably the only asset of hers that I would compliment her on. Red Carpet Ready they call that? Can you see what a mess that is? It's like a 5 year old was playing hairdresser and just stuck a piece here, another piece there, another one there, put it all in with bobby pins and called it a day. Or her stylist was in a really big hurry, and blind, and just grabbed and pinned. When it's a little shorter, the free hanging 'do is a little cuter because it looks like I'm just a little scattered and was in a hurry but when it's longer like this, it just looks like I have no patience and just whipped it up. This is most often how everyone sees me. Since I don't walk red carpets, I pretty much wear it the same way all the time and never give a second thought to what I should do with it. It takes all of 3 seconds and no skill. If I make the mistake of using a barrette instead of an elastic when I run, I can whip it up and snap it together as I run. That's how difficult it is. If you read the whole post, you'll see they give directions on how to make your own hair look just as bad as like Taylor's. And I think that looks great. 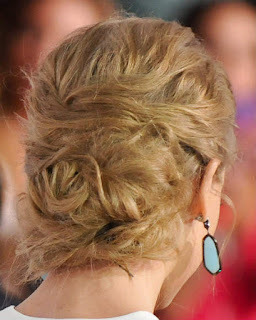 Taylor Swift's rat's nest is Red Carpet Ready. Implying that it's very complex and could never be done quickly, nor should it be worn for everyday style. 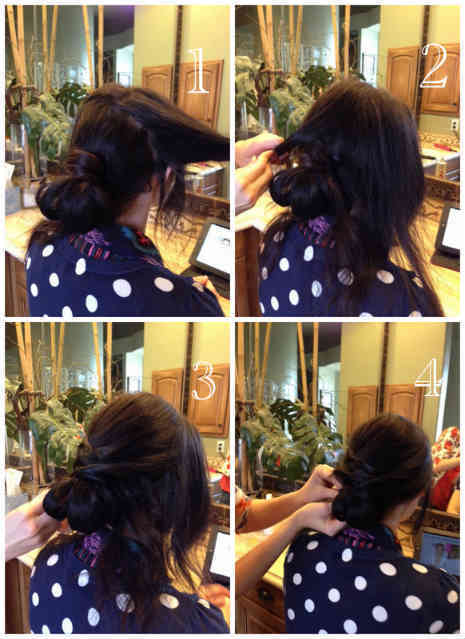 There are 4 basic steps to go from a nice chignon to a total mess. 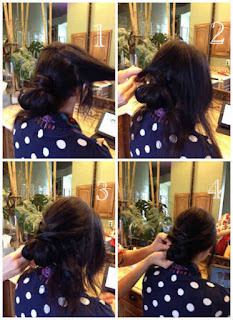 My sleeker, takes 2 seconds updo is my ready for anything, every day/night style. Dress it up, dress it down, no one really cares. You could almost do it one handed. And I didn't even try to make all of the hairs lay flat. It's way too complex for me to even try to give you step by step instructions. You'll just have to wait for the video. Now get outta my way. Red Carpet, here I come! I'm horrible with hair! Makeup and fashion I can do - hair is one thing I cannot. I have no patience for it. My hair is either up in a bun (not brushed) or down (brushed). That's about it. Once in a while I'll do a simple braid - no fishtail, no french, just a regular uneven braid. Newest follower from the Aloha Friday Hop!